To kick off the Games’ coverage, audiences will be encouraged to download a new app – which won’t offer up scores or medal counts. Rather, CBC is dishing out 360-degree content that will work with different virtual reality headsets and get audiences as close to the action as possible, without actually needing to be on the ground. It’s a bit of a gamble: VR headsets aren’t widely used, and 360 content isn’t cheap to produce. But the pubcaster, like many other broadcasters, streamers and content producers, is banking on the fact that VR will, one day, be able to bring in some revenue. For most players, it’s all about preparing for the day virtual reality will be mainstream. In the case of CBC, the Olympic VR project isn’t a huge risk in terms of investment, says Chris Irwin, executive producer of CBC’s English Olympics coverage. Not only has Visa come on board as a VR sponsor (alleviating the cost on the pubcaster), but it’s also a project jointly undertaken (and thus funded) by a number of Olympic broadcasters around the world. It’s not an out-of-place concern: a mere two million headsets will be sold in 2016, according to the 2016 Virtual Reality Industry Report from Greenlight VR. In comparison, more than 1.5 billion smartphones and 206 million tablets were shipped last year alone. The Industry Report also found that the space won’t likely be financially viable for at least another half a decade – at the earliest. Until then, much of the content is being made on the cheap, or falls squarely in the realm of marketing and promotional activities. Its current valuation is a $1 billion, with the hardware and software required making up 70% of the market, which is peanuts in comparison to the broader entertainment industry. But common refrain of pro-VR supporters is a bit Field of Dreams-esque: if you build it, they will come. The “it” in question is content. But the same argument was made for Google Glass (which is no longer in production) and even content marketing (many marketers are coming to terms with that fact that their content efforts need to be promoted). But that’s not to say there isn’t a flurry of activity backing the VR hype: Facebook says more than 100 million hours of content have been viewed on its Oculus Rift device. Google has been steadily committing to the space: in 2014 it launched a low-tech cardboard headset in 2014, (and more than 50 million compatible applications have been installed), then invested in its Jump team that’s meant to facilitate 360-filming. It’s now focusing on Daydream, an Android VR extension, designed to simplify access to high-quality VR. 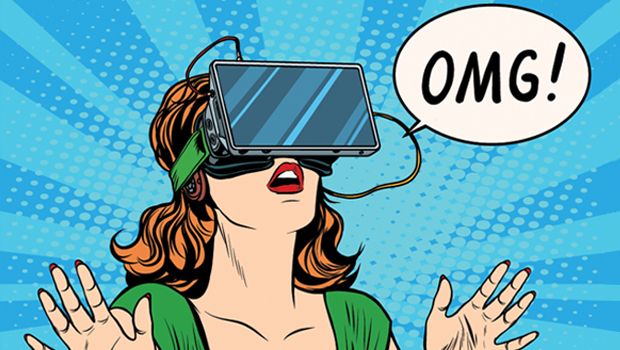 Both major and minor Hollywood players are all investing in VR: many big-budget films are getting their own 360-extension, such as the Hunger Games or the Martian virtual reality experiences, while independent production companies, like Toronto-based Smokebomb, are exploring new storytelling formats, such as the upcoming VR experience Slasher, which puts audience members in the hot seat of an hour-long narrative horror movie. The New York Times distributed 300,000 cardboard headsets to subscribers in the hopes that its readers would start tuning in to the VR content it was creating (such as Voyages, which puts audiences on the ground with the paper’s photographers around the globe). Hulu created several short-form immersive products, such as a behind-the-scenes feature from the Hulu original series RocketJump: The Show, rather than going all-out in investing in original, long-form content optimized for VR (since it can be costly and difficult to produce). All of this tells California-based virtual reality production company Ovrture’s Mike Drachkovitch, that the platform is already a legitimate line of business for many organizations. Companies are investing in this space heavily, though he concedes revenue generation is still being explored. While there’s the broadcast standards of content licensing, in-app or in-experience purchases and subscriptions, Drachkovitch is most excited about the VR-specific revenue models that will start to emerge over the next few years. While he can’t provide much detail about the company’s plans, he does have high hopes for marrying live experiences, such as concerts, and virtual reality. “Three-sixty video is here to stay,” he says, pointing to the immense popularity of the format on non-VR devices, such as Facebook 360 and YouTube 360 through desktop. And it’s that popularity that will help lower the barrier to entry for those considering buying a headset or not, he says. That’s what the CBC is banking on. While many Canadians have a familiarity with VR (a much greater one than those in the States, according to CBC polling data), Irwin doesn’t hold the notion that the Olympics coverage will sway everyone to go out and buy a VR headsets. Rather, he sees it as an opportunity to peak their interest. Irwin likens VR to the shift to HD a few years ago. Want to read more? Check out the CMF’s Mid-Year Report, where it checks in on the future of the virtual reality platform.